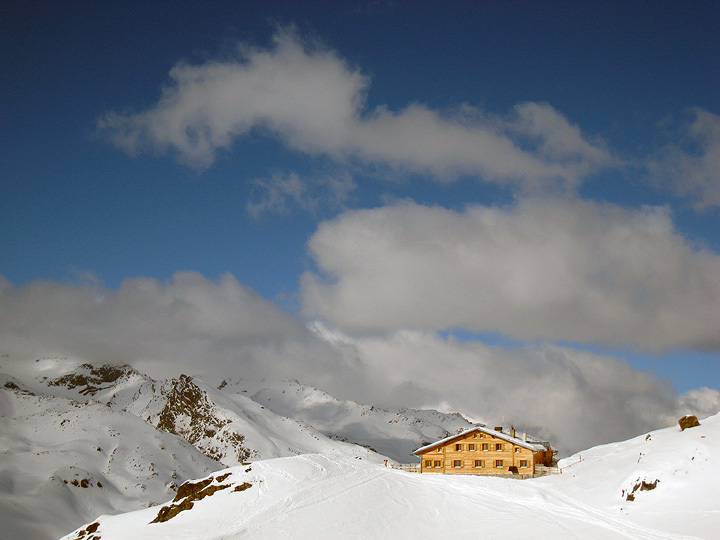 Sulden (or Solda, as it is known in Italian) is a small village at the head of Val Solda in Italy's Tirol. It is home to a relatively small ski resort and has a relaxed feel that appeals to families and those that like to get away from the giant complexes of Ischgl or St Anton. But it is set in a spectacular location, under the towering walls of the Ortler peak, which rises over 2000 meters above town to an elevation of 3905 meters. After a night in our hotel, we ride the lift system (one cable car, then followed by 2 chairlifts) to reach the top of the Solda ski complex, 3200 meters. From here, we have a short ski down, then a bit of side stepping to reach the Passo del Madriccio at 3123 meters. We leave the Solda valley and descend into the upper reaches of the Marteller valley down the Valle Madriccio. At about 2200 meters, we leave the axis of the valley and traverse a short way to the Zufallhütte. This is a fine opportunity for a cappucino and apple strudel. At the Zufallhhütte, we put on our climbing skins and head west, up the main Marteller valley, towards Monte Cevedale. Our goal for the day is to reach the Marteller hut, which is located on a bench of rock some 300 meters above the floor of the valley at 2610 meters. As with all the huts in the Ortler area, the Marteller is very comfortable, with amenaties including showers, a heated boot drier, and of course, a full bar. 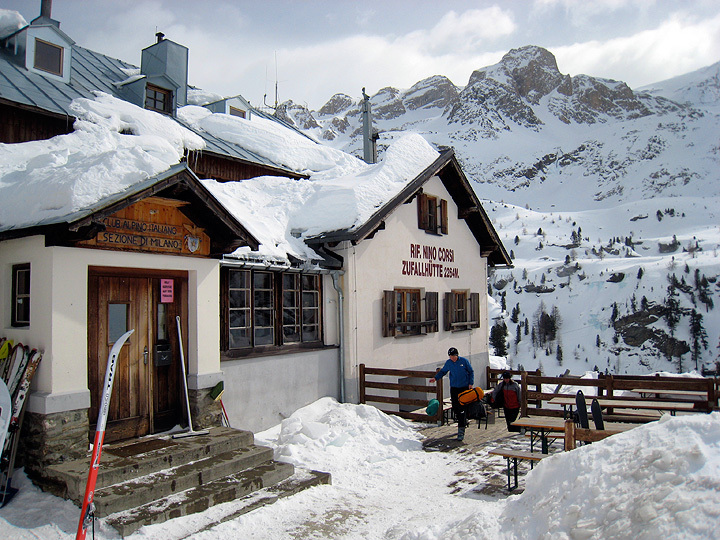 This is a relatively short day, and if we still have energy to burn after arriving at the hut, we can continue touring above the hut up towards the Cima Venezia. Click on pins and lines for lables. 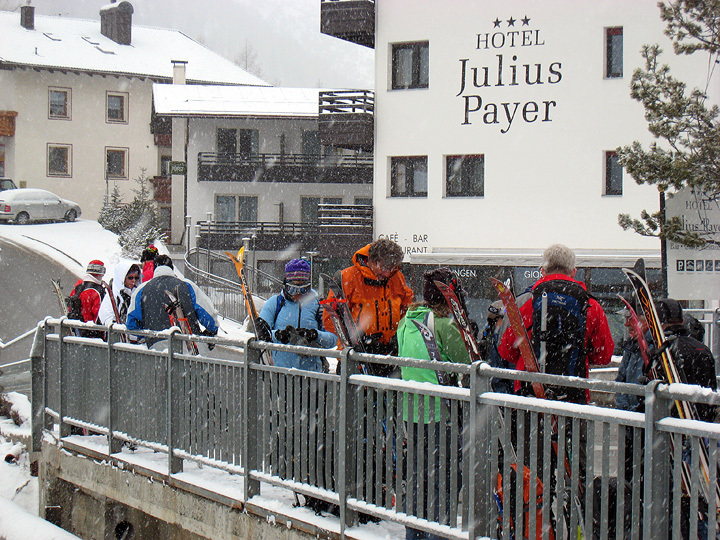 Starting our tour in a squall as we wait for the ski bus, we know what this means... Powder! The top station of the Sulden ski area's cable car, the Gran Zebru in the background. 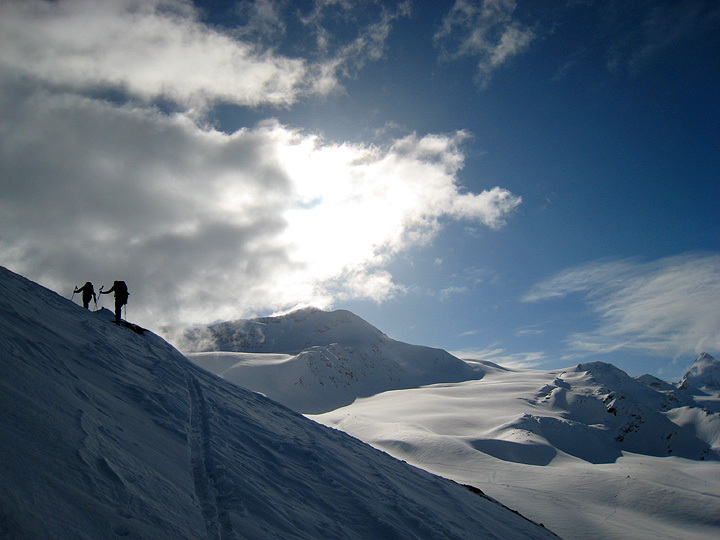 Leaving the Sulden ski area behind, we glide down the Madritsch valley. Looking back up the Madritsch valley we just skied down. The Sulden ski area is behind the fog-enshrouded ridge. We often stop for a strudel and coffee at this hut, the Zufall hut above the Marteler valley. 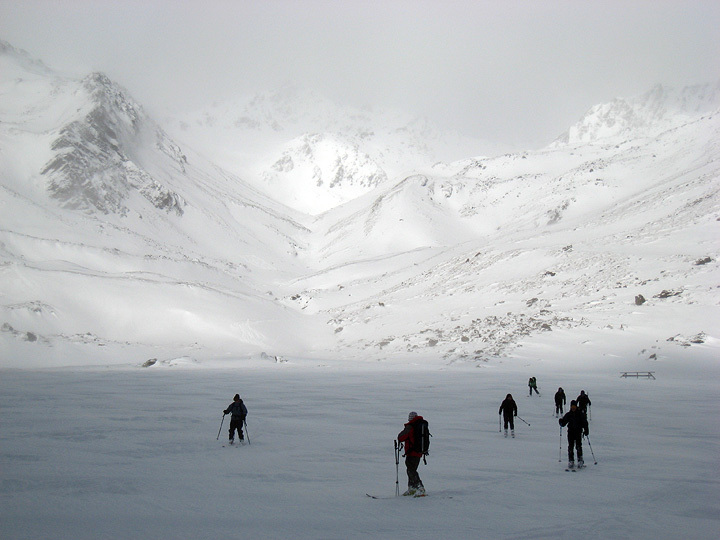 We have about an hour's more skinning to the Marteler hut. The Marteler hut, basking in sunshine! Monte Cevedale in the background as we tour above the Marteler hut.